As an expression, it’s never too late to bake a Christmas cake, may not be in the same league as one of my favourite quotes ‘It’s never too late to be who you might have been’ (George Eliot). 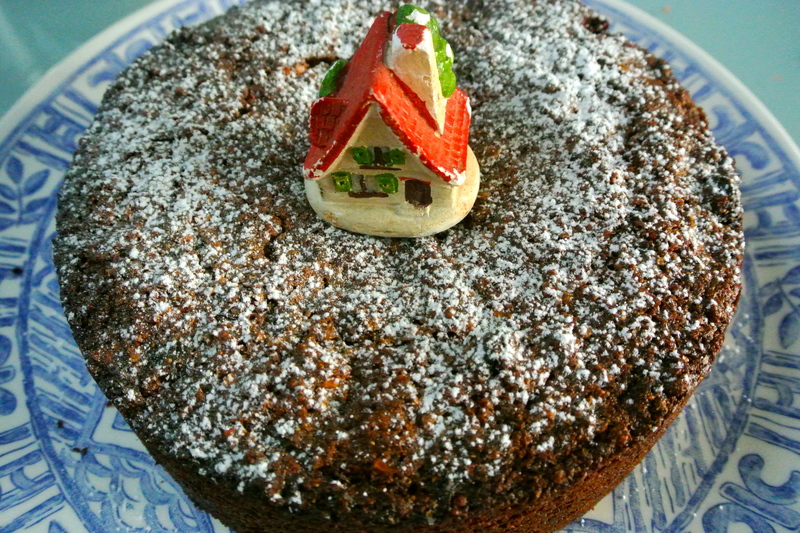 This recipe is from a Delia Smith Christmas Cookery book; she calls it last-minute Christmas mincemeat cake. It seems to prove the point that as in life so too in Christmas baking it’s never too late. Once cooked it can be iced in the traditional way, topped with a glazed nut topping, or simply left as is. Before you start making the cake preheat the oven to 170°C, then grease and line with greasproof paper the sides and bottom of an 8 inch (20cm) round cake tin. Put all the ingredients into a large mixing bowl including the eggs, just break them in. Then using an electric hand-held mix blend everything together thoroughly. Spoon the mixture into the prepared tin and pop the tin into the preheated oven. Depending on your oven the cake will take between one and a half and two hours to cook. It’s done when you press the centre of the cake and it feels firm and springy. Update: I should have mentioned that this cake can be *feed* in the normal way. To do so simply use a fork to prick the bottom of the cake allowing the fork to go in a couple of inches and then gently spoon over your chosen spirit, I am going to use brandy. You are so right K I think I will *feed* the cake with some brandy today. I am a last minute person so this cake is a godsend. Not such a godsend is the amount of calories per slice! Thank you, that’s exactely what I needed! Thank you Dina for your kind holiday wishes. Gas Mark 3 Tara sorry for the delayed reply. You have missed out 5 oz of dark brown sugar from these ingredients. I am so sorry. I have just amended the recipe thank you for letting me know.